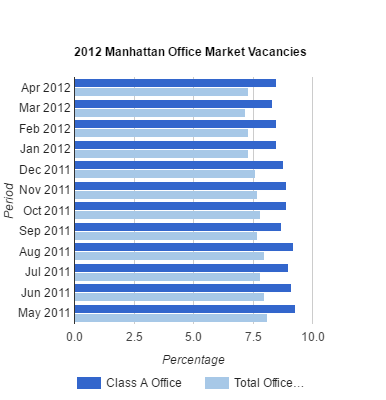 In the first quarter of 2012, Manhattan office leasing is the leanest it has been in almost three years. About 5.7 million square feet of space will be leased in the first three months of the year in Manhattan, marking the lowest volume of leasing since the second quarter of 2009, when 4.5 million square feet was leased. The pace of Manhattan leasing activity through February was down 40 percent from the same two months in 2011. Commercial landlords and real estate brokers alike are becoming frustrated with the lack of activity and the negative absorption since the final three months of 2011. Part of this year’s 40 percent decline in activity is due to a many giant deals early in 2011. This year’s activity is actually just 20 percent off the 10-year average and Manhattan’s vacancy rate remains a healthy 9.3 percent. Demand is expected to come from law firms, who are taking a larger role in the growing regulatory financial environment. Law, accounting and consulting firms added 32,000 jobs in the city last year. Larry Silverstein said he believes the leasing environment will improve once a new president is elected. February saw 190,000 square feet of negative absorption, although February’s 1.47 million square feet of total activity was a slight increase from January’s 1.44 million square feet. Asking rents in Manhattan increased $0.16 per square foot, to $54.40. The biggest decline in leasing was in the Midtown submarket, where the 810,000 square feet of leasing in February a 31 percent decline compared to the five-year average of 1.17 million square feet per month. The first two months of 2012 saw nearly 50 percent less leasing activity than the same months in 2011. Meanwhile, the availability rate in Midtown increased by 0.3 percent, to 11.7 percent year-over-year. Large decision-makers are all being very cautious, and you won’t see that break… until the presidential election in November.